The United States and the European Union (EU) should make greater efforts to cooperate in developing policies and solutions to challenges posed by technology and the digital world – particularly around data privacy and censorship – according to European Commissioner for Justice, Consumers, and Gender Equality Vera Jourová. 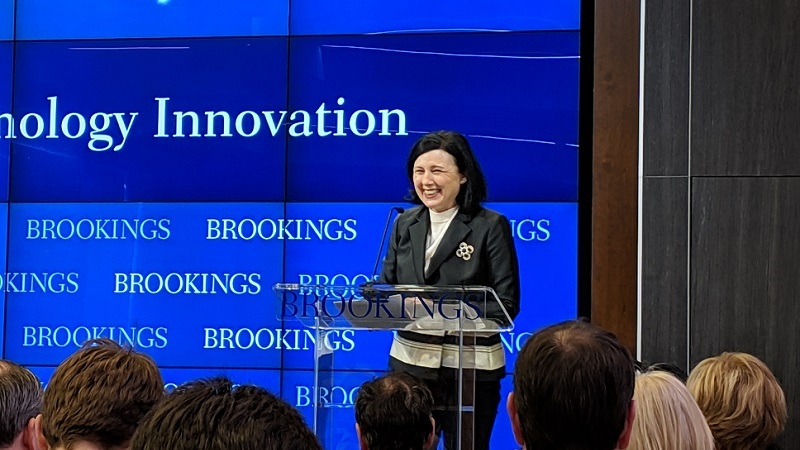 Jourová, who advocated in favor of the U.S. adopting principles similar to the EU’s General Data Privacy Regulation (GDPR) at a Brookings Institution event April 11, said that Europe and America were built on foundations of democracy, and that both should work to reassert control of democracy in technology and put people at the center of the technological revolution. “I want to see Europe and America working together because we are democratic societies built on similar values, and we are exposed to similar problems,” Jourová said. Europe looks to preserve broader freedom for platforms to operate, Jourová said about GDPR, but it also looks to help solve the problems those platforms helped create. By working together with industry, Europe and the U.S. can help secure user data, create accountability, and scale different responses to instances of hate speech or violence online. Jourová offered ideas that both the EU and U.S. could adopt, including creating a people-first approach, ensuring ethical approaches to creating technology, having companies implement humanistic values in their algorithmic designs, creating accountability, resisting the temptation to over-regulate, and finding a way to let startups innovate and grow. Jourová said she met with four U.S. senators from both Republican and Democratic parties about data privacy and online regulation. Although she said they had different views about how to craft Federal legislation and whether to prioritize people or companies, she felt optimistic that they will continue working toward a solution and eventually be able to work collaboratively on the matter on the international front. “It is time to shift up the gear to work together and become a global rule-maker rather than wait on the sidelines,” Jourová said.